The Cyclone24 Corporate Cycle Network returns this March. 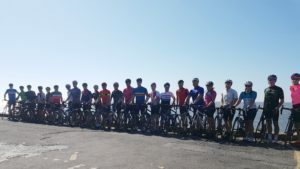 Launched in 2017 with monthly meet ups, it aims to provide networking opportunities for like-minded cycling enthusiasts across Cardiff & the Vale of Glamorgan. The first of our 2018 meets will take place in March and follows our usual format of meeting at 7.45am for an 8.00am roll out. Rides typically cover 20-25 miles with some longer rides planned for the summer months. Ride times get us back into Cardiff for around 9.30am for coffee and breakfast. Kicking off our 2018 meets, our first ride is sponsored by Stills Branding.